Gojirathon is me just writing up some thoughts about the movies I see while I conduct my little marathon of Godzilla-movies in anticipation of the new Hollywood retooling. Why Gojirathon and not Godzillathon? Well, because Rolfe already did his Godzillathon as part of his Monster Madness, and I don’t want to steal his work. I’ll be using the terms, G, Big G, Godzilla and Gojira somewhat interchangedly… since I can be a bit lazy at times, when it comes to these things. Well… This is embarrassing to say the least. I made such a huge deal in the last entry about missing out on a whole origin story for how Mothra is all accepted as a member of the earth defence force. I mean. How should I put it. Because, there was indeed a film from 1961 called simply Mothra (Mosura). But then I took a look at my list from Toho Kingdom. And I goofed up quite a bit. Because… yes… It turns out that in 1964 there was Two films with Godzilla. The one with Ghidorah. 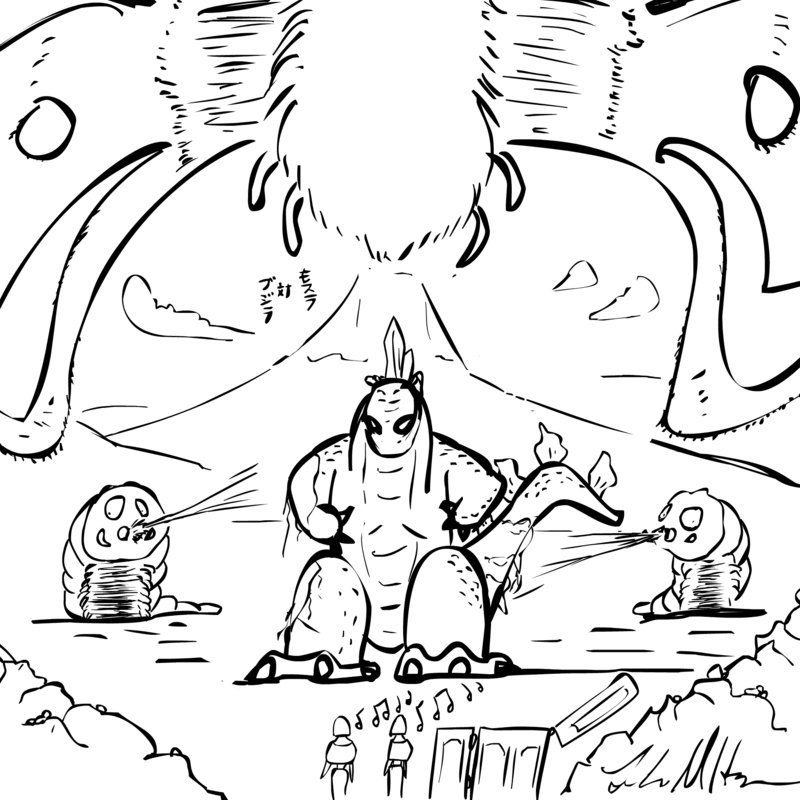 AND… (sighing in embarrassment) another one called Mothra vs. Godzilla (Mosura vs. Gojira). Gomen nasai! As they would put it. But as I have now gotten the apologies out of the way I can realize too, that I had already seen this one while trying to push my way through a Godzilla-marathon a few years ago. For some reason I didn’t get any further than this Mothra movie though (in all fairness, it was billed as a Mothra-flick against Godzilla. Just like King Kong vs. Godzilla was advertised more as a King Kong spectacle than Godzilla, But as fans had their say. Big G is the one that we want). And I am not sure alltogether why I stopped there the last time. Sure, the film is a bit more basic in its approach. The characters are a bit more freaked out at the first sight of the twins priestesses/fairies and Mothra is given a proper origin story. But then again. What I think was missing here was the… sillyness? Yes. A movie like this works best when the tone is all the way in some direction. Complete silly as in King Kong or dire awareness as in the first two. This was more middle ground. And me starting to feel a bit of sleep-depravation might not have helped. It was just. Decent. Without anything really standing out. And it seems like Godzilla is becoming more and more of an underdog in the series. So much so that I really appreciate when he finally got to win outright against Ghidorah. Ok. Now that we’re back on track, maybe we’ll get to that Astro-Monster entry anytime soon. And which one was the one with Jet Jaguar again?